The smallest prayer, will still be heard. It happens sometimes that after I write a blog I will get a little message that says I missed something or I could have been clearer. Evidently that happened yesterday. In a nutshell the message was that if we but look around at the magnitude of the Universe that surrounds us, how can we not believe in miracles. Today we were presented with a song that further exemplifies that message. It helps to clarify it. Further, I am supposed to remind us that we are part of the magnificent Universe. We are part of it all. We are a miracle. We are miracle makers. We are miracle receivers. 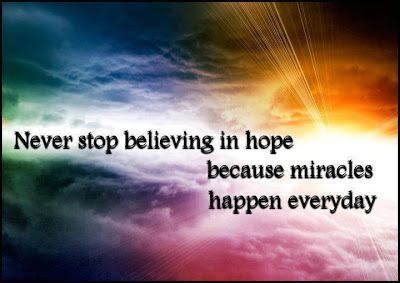 Miracles surround us each and every day. We are asked to keep our hearts, minds, ears and eyes open that we be prepared to recognize and realize them. -Meditate/pray….put yourself in that place of joy that is always ready for miracles. -Pick at least one thing….the first thing that comes to your mind…..and feel gratitude and joy. -A great relaxing dinner out with my friend and house guest, Jody. -Fabulous readings for Jody and I from Mark.